August is the month of holidays here in Italy. Industries close, schools are still closed and everything will go by slower, like during Christmas time. That’s why there are lots of events particularly in August. As usual I have tried to select the best and the most interesting events of each region from the point of view of traditions and the ‘living like a local’ style. Here following the list of Italy’s events in August divided by interest. 45th Fëta di Teteun – Gignod, Aosta Valley – 17-19 August: the ‘Teteun’ feast is dedicated to the typical cold cut of Gignod prepared with the udder. Festa del Lard D’Arnad – Arnad, Aosta Valley – 24-27 August: the lard of Arnad is protected by the D.O.P. label and obtained by the pork shoulder weighing at least 200 kilos. It is matured in old wooden containers with salt, water, spices, natural flavourings and mountain herbs. Fëta di Trifolle – Allein, Aosta Valley – 24-26 August: a festival dedicated to the potato and the Sorsa di Allein, a typical dish of Allein. Sagra della ortica – Malalbergo, Emilia-Romagna – 30-31 August, 01-02 September and 6-9 September: the nettle (‘ortica‘ in Italian) is a precious herb that can be used in every dish and you can taste it in Malalbergo in province of Bologna. Fiera dell’aglio – Voghiera, Emilia-Romagna – 3-5 August: the ‘aglio‘ (i.e. garlic) has received the D.O.P. label and from 3rd to 5th August you can taste it in many different ways. Grande rustida dei pescatori – Cesenatico, Emilia-Romagna – 14 August: Cesenatico is a beach town along the Adriatic coast, where every year the fishermen roast the fish. 35th Festa del Grano – Gattatico, Emilia-Romagna – 2-23 August: during the feast of the wheat there will be the reenactment of old activities, like the threshing, the harvesting, the cooking of the Parmiggiano Reggiano and also the baking of bread and the grape pressing, and the exhibition of tools and machines. Sagra della Spianata – Maiolo, Emilia-Romagna – 14 August: ‘spianata‘ is a bread to taste with the local cold cuts while you admire the view from the Rocca in Maioletto. Sagra della Spiga – Gangi, Sicily – 12 August: this festival remembers the Sicily’s agricultural traditions. 10th Festa del Pomodoro di Pachino IGP – Pachino, Sicily – 11-13 August: there are many different kinds of tomato. The ‘pomodoro Pachino‘ is one of them, where Pachino is the name of the original place. Street Food Fest – Sciacca, Sicily – 8-12 August: an occasion to taste all the Sicilian street food. Azzurro Fest – Sciacca, Sicily – 2-5 August: a feast to celebrate fish. 35th Sagra del Canestrato IGP – Moliterno, Basilicata – 9-10 August: the Canestrato is the only one (pecorino) cheese in Italy that has received the I.G.P. label. Sagra del Panino della Nonna – Giovinazzo, Puglia – 7-8 August: do you feel nostalgia of your nonna preparing sandwiches? For 2 days you can eat typical panini stuffed with all sort of things in Giovinazzo. Do you like Italian wines? On 9th and 10th August in some Italy’s regions Calici di stelle will take place. It is an event in the night of the falling stars (10th August: San Lorenzo night), when you will have the chance to taste some good wines. 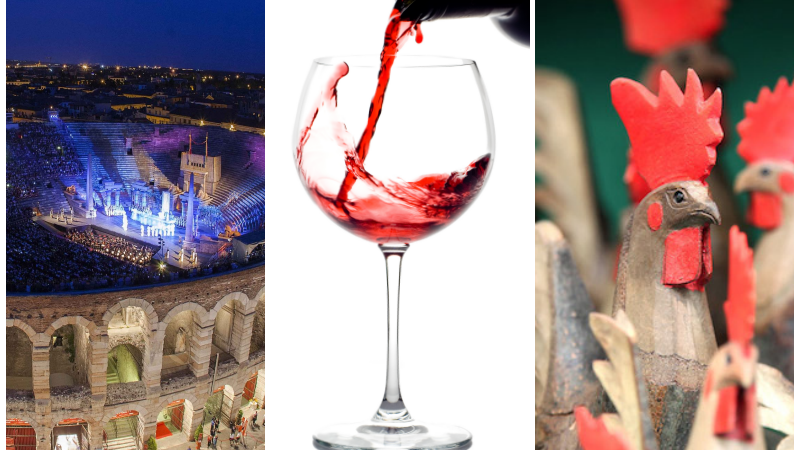 Calici di Stelle is organised by Movimento Turismo del Vino, as well as Cantine aperte in May. As we have seen in July, ‘Montefalco nel bicchiere‘ in Umbria still continues until 27th October. 33th Veillà d’Etroble – Étroubles, Aosta Valley – 11 August: during the day there will be a parade of the masks of the historical Carnival of Coumba Freide. Processione di Punta Chaligne – Gignod, Aosta Valley – 16 August: the parade remembers the gratitude of the survivors of the 17th-century plague. 35th Bataille des Chèvres – Aosta Valley: the battle of the goats is a very particular event that takes place in different towns. La Corte de Tiezer – Tiezer, Trentino Alto Adige – 4-11 August: a trip in the past time discovering hidden places in Tiezer. Rustico Medioevo – Tenno, Trentino Alto Adige – 4-12 August: another edition of Rustico Medioevo, an event that recalls all the activities of the Middle Age. Festa di Garibaldi – Cesenatico, Emilia-Romagna – 4-5 August: on 2nd August 1885 Giuseppe Garibaldi set sail toward Venice to help the city to get free, but he was stopped not far from Cesenatico by the Austrians. Druidia – Cesenatico, Emilia-Romagna – 16-19 August: how did Celts and Romans live? La Torre di Giovedia – San Mauro Pascoli, Emilia-Romagna – 26-27 August: a plunge into the Middle Age when Concordia De’ Parcitadi and Malatesta da Verucchio got married. Palio di Siena – Siena, Tuscany – 16 August: the second race (Palio dell’Assunta) of 2016 will be held on 16th August (read the 10 facts about Palio di Siena). 54th Palio delle Contrade – Allumiere, Lazio – 18-19 August: a donkey race dating back to the first years of 16th century. Palio delle Contrade – Garda, Veneto – 15 August: the contrade will challenge for the statue of the Holy Mary and during the Regata delle Bisse, a regatta on particular boats, in the Lake Garda. Palio dei Normanni – Piazza Armerina, Sicily – 12-14 August: it is the biggest historical reenactment and the oldest medieval festival of southern Italy. Medieval Feast – Randazzo, Sicily – 12-13 August: an event that remembers the visit of Bianca di Navarra, Sicily’s vicar from 1409 to 1415 (this year it has been held in July). 21th Miti e leggende – Motta Sant’Anastasia, Sicily – 11-19 August: a town invaded for a week by lots of medieval street artists. Palio della Mannaja – Pietralunga, Umbria – 6-12 August: inside the town 5 teams will push a medieval cart of 430 kg used to carry men sentenced to die. 46th Palio dei Terzieri – Città della Pieve, Umbria – 8-19 August: read “Historical festivals in Umbria”. Torta dei Fieschi – Lavagna, Liguria – 14 August: it remembers a big cake prepared for a wedding in the Middle Age. Festa Maggiore – Terlizzi, Puglia – 2-8, 12, 26 August: a triumphal cart 25 metres high pulled by the whorshippers through the streets of Terlizzi. Passeggiata dei Giganti and Vara di Messina – Messina, Sicily -13-14 August: it has been helding for more than 500 years. 50th Rievocazione Storica della Macia – Spilimbergo, Friuli Venezia Giulia – 13-16 August: the event takes the name from the macia, that is the ancient unit of lenght of cloths used since 1438. 724th Perdonanza Celestiniana – L’Aquila, Abruzzo – 23-29 August: the ancient Jubilee established by Pope Celestino V.
66th Contesa del Secchio – Sant’Elpidio a Mare, Marche – 10-12 August: the oldest historical reenactment of the region with more than 1,000 walk-ons. 38th Disfida del pallone col bracciale – Treia, Marche – 27 July-5 August: it is a old game played with a bracelet – an hardwood sleeve with big spikes – and a ball to throw against a wall. 61th Quintana di Ascoli Piceno – Ascoli Piceno, Marche – 14 July and 5th August: one of the most important event of this region. 46th Medievalia and Palio di San Ginesio – San Ginesio, Marche – 13-15 August: a challange that remembers the attack to the castle of San Ginesio that had been blocked by a woman. 50th Foire d’Été – Aosta, Aosta Valley – 4 August: the first edition was in 1969 and now it has become a not-to-be-missed exhibition to discover the typical handicrafts. Fiera dell’Artigianato valdostano di tradizione – Antey-Saint-André, Aosta Valley – 12 August: more than 200 students of handicrafts from Aosta Valley show their works along the streets of the town. 38th Artigianato Vivo – Cison di Valmareno, Veneto – 5-15 August: handicrafts, performances, local food and much more with the view on Castelbrando. 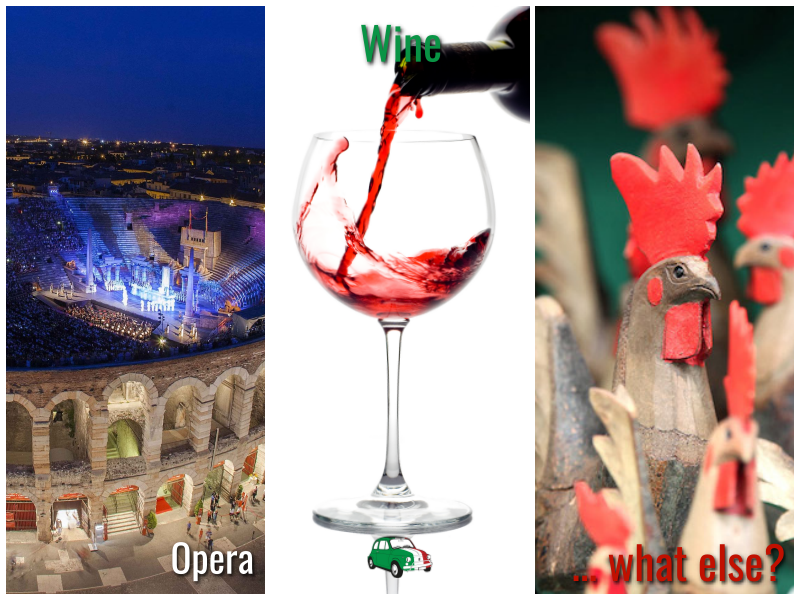 Arena Opera Festival – Verona, Veneto – August: one of the most important opera festival in Italy in a special location, such as the Arena in Verona. 52th Macerata Opera Festival – Macerata, Marche – 20 July-12 August: it takes place inside the Sferisterio, an old open air arena in the centre of Macerata. 37th Rossini Opera Festival – Pesaro, Marche – 11-23 August: the other important opera festival in the north of Le Marche region. 18th Corinaldo Jazz Festival – Corinaldo, Marche – 5-7 August: 3 days of jazz music in the little town of Corinaldo. 44th Accademia organistica Elpidiense – Sant’Elpidio a Mare, Marche – 3, 10, 17 and 30 August: the oldest pipe organ concerts festival of Le Marche region. Stresa Festival – Stresa, Piemonte – 14 July-09 September: a sequence of events around Lake Maggiore. Suoni delle Dolomiti – Val di Fassa, Val di Fiemme, Val di Non – until 28 August: a lots of concerts in the Dolomites. Carpino Folk Festival – Carpino, Puglia – 6-11 August: a famous event for listening to the Italian folk music. 113th Fireworks festival 2016 – Lake district – 1 July-26 August: you will see performance in Cannobio, Verbania Pallanza, Santa Maria Maggiore and Omegna. 29th Ferrara Buskers Festival – Mantova, Lombardia; Ferrara and Comacchio, Emilia-Romagna- 16-26 August: international event of street musicians. Beach on fire – Cavallino Treporti, Veneto – 25 August: the longest fireworks in the world along 12 km of coast. Jesolo European Air Show – Jesolo, Veneto – 8-9 September: the show of the Frecce Tricolore, the famous planes of the Italian Aviation. Piscina naturale – Porto Venere, Liguria – 21 July and 25 August: for few hours the channel of Porto Venere will be a big natural pool thanks to the ban of nautical means. 38th Trofeo Città di Alassio – Alassio, Liguria – 9 August: a challange for those who love making sandcastles. I bunker di Recoaro – Recoaro, Veneto – 5 August: a walk to discover the bunkers of the World War II in the area of Recoaro. 35th Coppa Byron – Porto Venere, Liguria – 26 August: it is the most important swimming competition taking place in the sea of the Gulf of Poets. Would you like to recommend an event that you like? Write it in the comments below. I will be glad to add it.